I love my Diet Coke and typically drink two cans a day. It’s probably not the best habit, but, then again, I eat pretty healthy overall and I figure it could be worse. So how does this relate to Earth Day? Well, whenever I feel a little guilty about my love of Diet Coke, I think about the positives beyond the great taste and zero calories. My empty Diet Coke cans and opener tabs are not only recycled, but they actually help our patients at Akron Children’s Hospital. Every few weeks, I take a big trash bag of empty cans (sans tabs) to my local fire station and toss them into a bin. The cans are donated to the Aluminum Cans for Burned Children (ACBC) program, which raises money to help burn survivors and their families by selling the cans back to the aluminum industry. 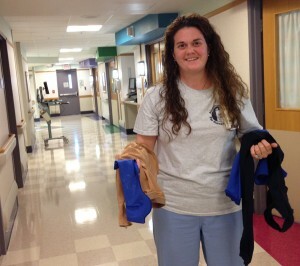 Becky Mundy shows some compression garments paid for with ACBC funds. These items help burn patients heal with minimal scarring and aren’t typically covered by insurance. ACBC also supports social events for burn survivors, as well as training and support for firefighters. Recycled aluminum also helps ACBC pay for a summer camp for burned children. Every year, burn survivors from Akron Children’s are invited to a holiday party. One of the awesome things about this party is that Santa Claus (volunteer Jim Hipp) is a burn survivor himself so he really relates to the kids. They may even notice the scars on his face are not that different from their own. ACBC also supports a summer camp, which our patients just adore, and Juvenile Firestoppers, an educational program for kids who have an unhealthy interest in fire. The Ronald McDonald House of Akron recycles pop tabs to bring in around $5,000 annually. This money goes to the little extras that make life a little nicer for the families staying at the house while a child is hospitalized. Money from the recycling has been used to buy toys, a computer for the families, a camera to take photos of guests and volunteers for the house’s Facebook page, and a Bose radio system for the dining room. Pop tabs paid for a camera to take photos of the many generous visitors to the Ronald McDonald House. 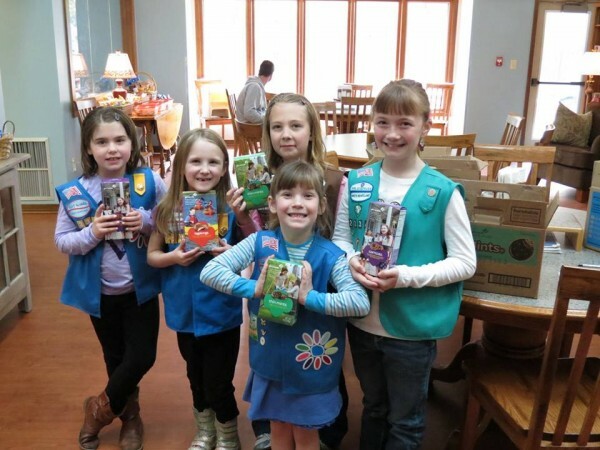 This image, which was posted on Facebook, shows Girl Scout Troop 2334, who donated Girl Scout cookies and handmade Easter place mats for the families staying at the house. You can bring the tabs to the house anytime, but Collins suggests you call ahead if a big delivery is coming. The number is 330-253-5400. You can also donate your pop tabs at McDonald’s Restaurants around Akron. Akron Children’s nephrology department also collects pop tabs and earns between $4,000 and $5,000 annually to support patient families. You can leave pop tabs for Nephrology at any Akron Children’s volunteer desk. 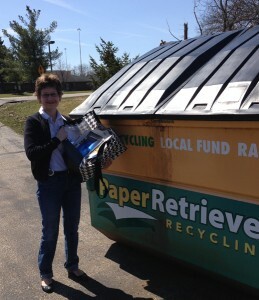 Recycling for the benefit of these programs is easy and requires just a little effort beyond my normal routine. Spread the word. Collecting cans and/or tabs are easy community service projects for scout troops, schools and other groups. After years of “collecting,” it’s hard for me to even imagine aluminum cans in a landfill when they have value and the ability to help others in need. And as an Akron Children’s employee, it’s gratifying to see how these recycling efforts bring real smiles and appreciation to our patients, perhaps through a toy, a camp experience, a holiday party, help with a medical expense, or some other gesture of kindness.